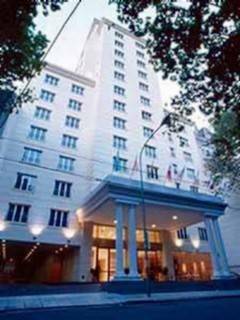 Five star deluxe Loi Suites Recoleta Hotel, Buenos Aires, as its name implies, is located in the chic area of Recoleta, within easy walking distance of restaurants, cafes, cultural attractions and the finest shopping to be found in Buenos Aires. The hotel offers 112 tastefully decorated, modern junior studio, executive studio and executive suites, combining style, comfort and technology. The restaurant serves international cuisine, in addition to regional meals and wines. There is also a pool-side snack bar and coffee shop. Leisure facilities at the hotel include a fitness room, sauna, Jacuzzi and indoor heated swimming pool. There is a lovely winter garden where guests can relax and stroll. Additional hotel amenities include: 24-hour front desk, concierge, post office, safe-deposit box, elevator, lounge, 24-hour room service, ADA facilities, parking, valet parking, barber shop, beauty salon, boutiques, 24-hour medical service, laundry service and guest laundromat, wake up service, business center, and three meeting rooms. Room amenities include: Air-conditioning, cable television, direct-dial international telephone, cellular telephone in every room, computer data ports, channel music, private bathroom with shower and bathtub, minibar, and work desk. Loi Suites Recoleta Hotel provides beautiful rooms in the heart of Recoleta, creating a wonderful atmosphere for exploring Buenos Aires.